$13.00 per day, discounts apply per week or month. Traveling with an infant? Renting a Travel System (infant car seat and stroller) is the most convenient way to go. 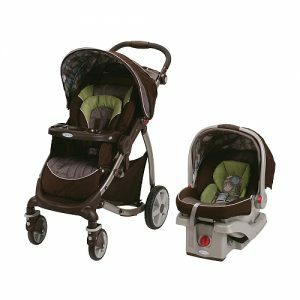 Easily transfer infants from the car to the stroller by lifting the carrier from its car seat base and snapping it to the stroller. Graco Travel systems are not available in Vancouver. All our strollers can be made into travel systems with car seat adapters please contact us for more information. Traveling with a young baby can be stressful enough without having to wake your child every time you get in and out of the car. At Wee Travel we are very aware of the importance of a sleeping baby! This system includes a rear facing infant seat and base (up to 1 year old or 22 pounds) and the corresponding stroller. This combination allows you to unsnap the seat from the base in your car and transfer it into the stroller, all the while watching your child sleep peacefully. It makes the transition from the car to naptime a breeze and allows those extra minutes of peaceful shopping in the mall. All our travel systems strollers are easy to fold and come complete with cup holders, large baskets, swivel front wheels, and are lightweight so they can be taken in and out of the car with ease. All the infant seats have the LATCH system as well as the ability to use the seatbelt (both are equally safe) should your car not be equipped with UAS anchor bars (most cars 2002 and newer are equipped with these bars). At Wee Travel we offer a variety of makes and models of infant seats such as Graco and Evenflo and we update them frequently.